This thing just had a new water pump replaced last summer, the mechanic said the fan clutch seemed tight, no play. But it still climbs to scary temps on hills with nothing in it, and were planning on going cross country this summer with it. Would love to upgrade the cooling system, possibly to an electric multi-speed fan system, but perhaps a complete cooling system flush is in order first? Ideas and suggestions very welcome. How hot have you seen it go? My 444E and pretty much everyone else's seems to run a bit on the hot side, especially over 55 mph. Just the nature of the beast, really. what temps are you reaching? if i remenber right mine reaches 211 and the fan cuts in and shuts of 204 , I have a horton electric clutch fan. ^^ dang, and I get worried when mine goes over 180 or 190.
ive been pretty much deep into this with my 444E..
for one, read the computer, dont rely on the dash gauge... mine reads too cold at lower temps and too hot at higher temps.. the dash gauge is just a representation of the computer sensor (the dash is on the CAN).. Navistar gauges are not real good..
Next, high RPMs will make it run hot.. seems a facxt of life.. to say navistar never built trucks that overheat from the factory is probably the case.. as these are school busses, designed for slow and go routes.. the 444E runs very cool in those circumstances..
Next, if you have a Viscous fan clutch. 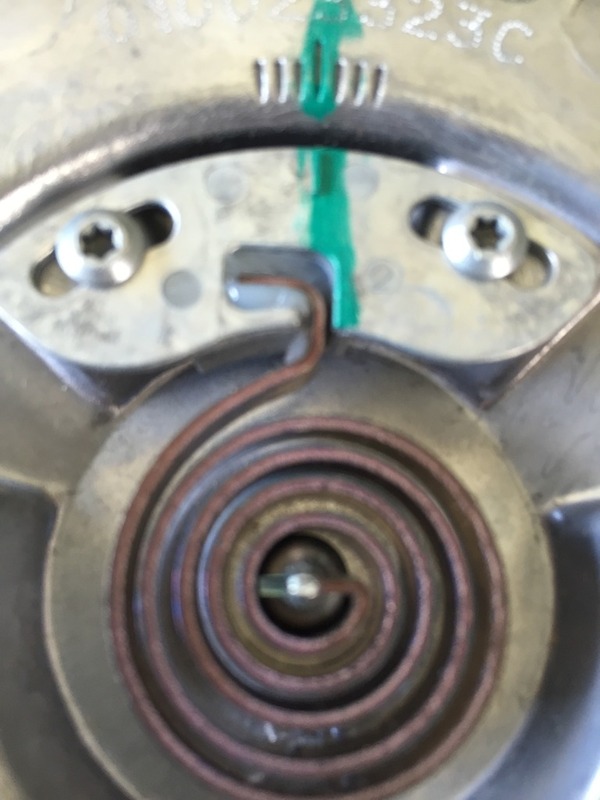 (it has the fins on it and the little coil on the front).. it is likely either no good, the wrong part, or misadjusted, .. if tyou arent hearing the road of a fan and tyou are approach 215 degrees.. the clutch needs attention.. 90% of the replacement fan clutches for 444E's are made and sold by Kit-Masters.. the clutches are built by Borg warner, but KM sets the temp too high.. I did some extensive measurements and upgrades to the cooling system on my bus.. I went from running close to 220 and having to slow down to 55 MPH in 90 degree heat to seeing a Max temperauter of 217 in 103 degree heat (not heat index, actual heat).. at 65 MPH.. so while it didnt completely solve it, it helped.. I replaced my water pump, oil pump, completely flushed my system and replaced with a 40% coolant / 60% water, + watter-wetter and (AMSOIL hugh performance ELC coolant), my MODINE radiator was boiled and cleaned.. I also repalced my viscous clutch with an electric Horton EC-450 and a 9 Bladed fan that moves more air..
my Now project is reducing my RPMs.. im installing a 6 speed allison overdrive auto transmission which will reduce RPMs and gives me Lockup... my guess is ill run cooler yet..
On one particularly long and steep pass it made the alarm go off before I could pull over, it was not pretty, lost some coolant, but was able to cool down pretty quickly after that, replaced all fluids, etc. so hopefully there was no long term damage done (fingers crossed). 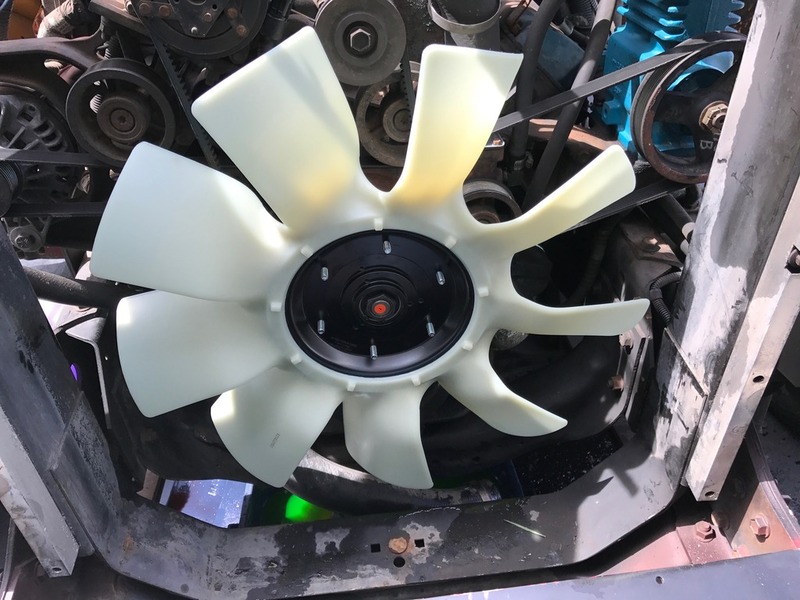 I dont hear real well, and it seems to me whenever I'd pull over and flip the hood to let it cool the fan was ALWAYS running, even once it got down to 180 or so (according to the gauge) so I'm not sure how the fan clutch works I guess. im pretty sure the thing spins even right after I start it!?! Im interested in the electric option, but might look into getting the rad cleaned as well. how much should this run me? Yes...check the rad itself. It has probably never been flushed in its' career and could well be full of crud. I have a scan gauge and that's how get the temp readings, in all the kms I put on my bus, the temp is always run the same, up hill, hot weather, or running wide open hwy speed, high 211- fan cuts in , shuts off 204 you can hear that Horton roar when it cuts in. the alarm goes off at 235.. if it goes off when you are climbing.. theres a good chance your oil temp is at 245-250.. your oil loses viscosity and breaks down .. your Oil Pressure will begin to erode when you get up that high too.. the oil pressure alarm comes on if your oil P drops below 25 PSI and your engine is over 2000 RPM. a viscous fan clutch will engage fully (fan roar) for the first few minutes you drive it when it is cold.. this is by design. if you dont hear that fan roaR again by the time you have 215 degrees then somethiong is broken.. either tha radiator is completely clogged (remember that clutch measure AIR TEMP from the rad.. and it shares that same air with the turbo cooler (noticve your radiator is split in the middle.. you only have a 1/2 a radiator... ).. or that clutch may be misadjusted or no good.. or the wrong part was installed..
here is what a kit-masters replacement clutch has for its temperature adjustment..
that green mark is factory at 170 degrees F AIR TEMP.. FROM A 1/2 RAD 1/2 turbo cooler.. each little notch is 10 degrees F.. you can move that down (to the left) to lower its ON temp..
this is a demonstration of the Horton EC-450 as I test ran it right after installation.. Im using a Dakota Digital controller so i can controller when it turns on and off ..
you can hear the Horton pulling in and out in this video.. its LOUD when it runs..